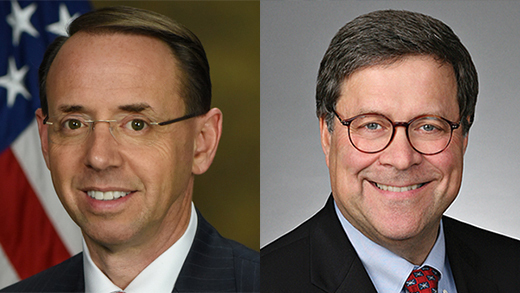 Deputy Attorney General Rod Rosenstein and William Barr. Deputy Attorney General Rod Rosenstein has indicated he plans to leave his post if William Barr is confirmed as attorney general, according to multiple reports based on anonymous sources. Some of the reports say Rosenstein has told the White House about his plans, while others say he has conveyed his thoughts to associates. Among the publications with reports are ABC News, the Washington Post, the New York Times, the Wall Street Journal, Politico, USA Today and the Associated Press. Barr’s confirmation hearing is scheduled to begin Jan. 15. Associates have said Barr was hesitant to take on the job unless he could choose his own deputy, according to the Wall Street Journal. Rosenstein oversaw special counsel Robert Mueller’s investigation into Russian interference in the 2016 election after then-Attorney General Jeff Sessions recused himself. Rosenstein is said to still have a role overseeing the probe, although it is now supervised by acting Attorney General Matthew Whitaker. Barr had criticized one aspect of the special counsel’s investigation in an unsolicited memo to the Justice Department. White House press secretary Sarah Huckabee Sanders said Wednesday that Rosenstein had always planned to stay only about two years, and he wants to allow the new attorney general to build his own team. He would like to help with the transition, however, Sanders said.